home / Multimedia / The Holy Land in videos / “We were all born here”: a documentary on the ..
On Saturday 7 November, at Catholic Action of Bethlehem, there was a presentation of the documentary “We were all born here – between beauty and strength, the elderly protagonists of the story of Bethlehem”. A way of preserving the memory of the living stones of Bethlehem, the elderly who through their stories bear witness to an ancient reality that is at risk of being forgotten. 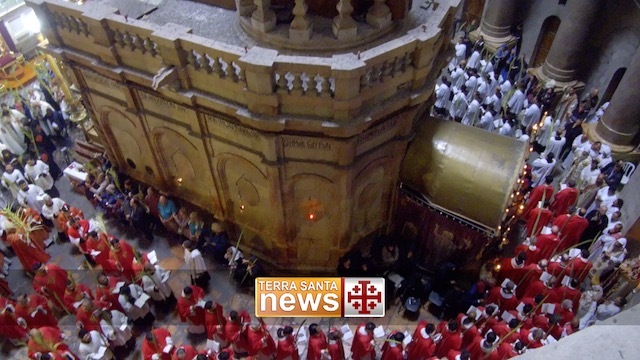 The documentary, product of a collaboration between the Christian Media Center and Association pro Terra Sancta, was born from the idea of offering a realistic picture of the society of Bethlehem today, recounting what people think, their fears, the difficulty of their day-to-day life, their memories and expectations for the future. 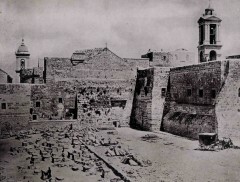 Along with the black and white images of an early twentieth-century Bethlehem, and color photos portraying the protagonists today, memories resurface and milestones in the history of the town and its inhabitants are retraced. The short film also highlights the stages that have led the Christian community to a slow and gradual emigration. An important message for everyone, young and old: contribute to maintain alive the Christian presence here. As fra Badie, parochial vicar of Bethlehem, notes: “The people are aware of the importance of remaining here, and continue to live here, where Christ was born; Christians must continue to live where He was born”. United, as a single family, despite the difficulties of the Bethlehem of today. You too can support the elderly of Bethlehem!